As a defensive firearm instructor I have been asked for my opinion about lights and lasers for guns used for daily carry and home defense. Well, you asked for it, so here it goes: Yes, and Yes! My daily carry gun is a Sig Sauer P226 with a Surefire X200 (pressure pad) with Crimson Trace grips. While this seems very bulky for a daily carry piece, it is the weapon I train with the most. I am a firm believer in the theory of the, “Man with one gun.” The theory is simple, beware of the man who only has one gun… ‘cause he probably knows how to use it. While I own a variety of firearms, this is the pistol I carry 85% of the time. 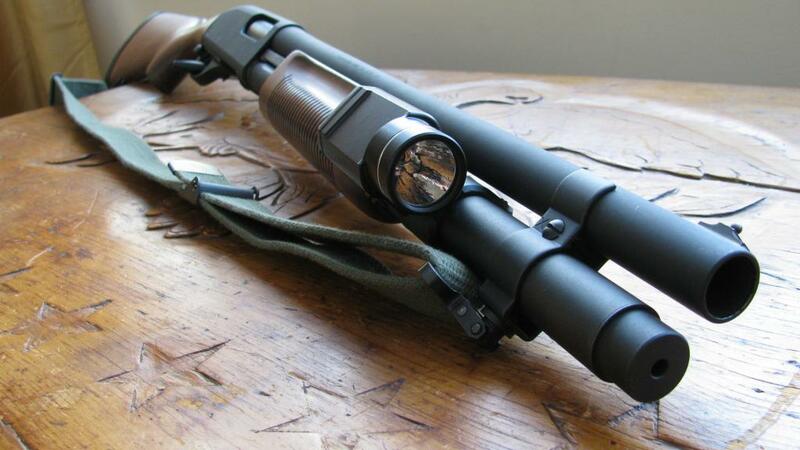 A quality weapon mounted light casts a tight circle of light about the chest size of a suspect at a distance of 7 yards or less. I’ve found that when shooting in low light at >21 feet, the pool of light illuminates center mass on the target. When pressing your shots you will hit your target almost point of aim, point of impact in a soccer ball sized area about center mass on your target. This is great for a sleepy eyed home defender who has clearly identified an intruder and either can’t see his front sight, didn’t invest in night glowing sights or can’t focus on the front sight. From the top of a staircase to the bottom, if the circle of light hits the intruder center mass, so will your shots. While the weapon mounted light should never be a substitute for a good sight picture, it can be a quick point shooting alternative. As always, try it and train it before you rely on it. The light is also a good way to keep you from tripping over objects as you move about in the house. Anyone with kids knows that stepping on a Lego in the middle of the night causes a string of inappropriate words unsuitable for a church picnic… and that’s the last thing you want when you are about to confront a potential threat. For this application, I recommend a light with variable settings. Some weapon lights have a “working light” which is a 20-30 lumen LED for you to use when moving and functioning and a high output 150+ lumen output for target identification. These are typically long gun mounted and are not often seen on a pistol size light. Pistol mounted lights are usually high lumen output and now we are seeing a trend towards a strobe as well. While the strobe can be disorienting to an attacker, it is not something your average home defender really has a use for. For everyday use, simple is better so save your money and remember the less features, the easier to operate under stress. Yet another advantage to having a weapon mounted light is your ability to keep both hands on the gun, giving you better overall control of the weapon. Two hands on a gun is the only gun control I support! If you can couple your light with a pressure switch, you have reached peak efficiency. A switch enabling you to have a momentary on and off gives you the opportunity to quickly illuminate an area, assess a threat, extinguish the light and move! Never stay static and activate your light from the same position over and over. The tendency for an intruder who is armed will be to shoot at the last known position where the light was, so make sure you are not there. Proper technique is: Light on, assess, engage (if applicable), light off, and move! I also advocate the pressure switch activator so you can completely manipulate the light system with one hand. This is important because in a home defense situation, you might have something in your off hand…like a child you are carrying to safety. Now, for the major disadvantage to a weapon mounted light: Muzzle sweep. The fundamental rules of firearm safety tell us to never point the muzzle at anything you are not willing to destroy. With a weapon mounted light, every time you sweep an area with your light, you are also sweeping your muzzle over that area as well. This is never a good idea when checking a room where a loved one is sleeping (or an adjacent room where bullets will travel through). Trigger discipline must be paramount, so keep your finger indexed properly on the frame of the handgun. Rather than sweep your muzzle over a room, I recommend a technique called Light Splash or Light Spill. The majority of American homes have ceilings painted in a white or light color. Keeping your muzzle up (as safe a direction as possible- unless downstairs) you can point the light at the ceiling and activate it. The bright light will spill or splash off of the lighter color surface and fill the room with enough ambient light to see almost everything, and clearly enough to identify a threat. As with everything, strapping a light on your gun doesn’t make you a gunfighter, like every other tool, you have to train with it. You don’t want to be unfamiliar with your light when you need it most and accidentally silhouette, illuminate or blind yourself. When it comes to selecting gear I want to recommend LED lights for home defense use. LED lights when coupled with a lithium battery have a very long shelf life, and are very durable. While you can get brighter incandescent lights, bulbs will burn out or break and typically do not stand up to abuse as well as LED lights. I am not sponsored by any company but I do recommend the Surefire X300 series and the Streamlight TLR series of lights. What about a light laser combo or just a laser? My experience has led me to believe that a laser alone is not a good idea without an illumination device married to it. Although my personal setup has laser grips, separate from the X200 light, they are never used singularly, always in tandem. The laser is an alternative aiming device and has a few unique purposes. For aiming, the laser is a great tool (if properly sighted/aligned). When making shots from odd angles, odd positions or when you can’t achieve good sight alignment, the laser is a great way to make sure you hit your target. Lasers are typically zeroed at 10-15 yards on a handgun and maybe 50 yards on a rifle. It can assist shooters in making rapid hits when they may not have time to get a sight picture, but again, it is never a substitute. Lasers are also excellent training tools and can teach a shooter trigger discipline. After safely clearing your weapon, turn on your laser and point it at wall. As you press the trigger, watch the laser and see how much it bounces or moves. It is a great way for you to tell which way you are pulling, pushing or slapping the trigger. Dry fire practice with a laser is invaluable. I have a good friend who set himself up a good shotgun for home defense. On his shotgun he added an extended magazine tube, a sling, a weapon mounted light and laser combo. With a side saddle for extra ammo, he was all set to defend his castle and was very excited about his set up. To ensure his defense plan was sound he also had his wife handle and manipulate the shotgun… which was way too heavy for her tiny frame. While the shotgun was easy for my friend to shoulder, manipulate and clear rooms with, his wife had a much harder time. Enter the laser. With the laser aiming device, the very small stature wife was able to carry the gun at hip level when patrolling the house and with the laser, she knows she can point, shoot and will score hits against an intruder. While this is not an ideal solution to the problem, it made one tool, useful to other members within the household. This discovery also gave my friend an excuse to go shopping with his wife for her own shotgun. Lasers are also most effective in low light or darkness situations. During day light hours, red lasers and most green as well get washed out by sunlight rendering them ineffective. This can also be true of very high lumen output weapon mounted lights. That is why I recommend the 150-200 lumen range for a home. While it is cool to have a 400+ lumen light you can cook bacon on, it is impractical and will blind you as well in a room sized area. Brighter lights will wash out your laser which defeats the purpose of having one in the first place. My X200 and laser are a good match and when shopping for laser & light combos, make sure you can see the laser despite the light. Lasers are NOT to be used for intimidation. Despite what Hollywood has shown you, a laser is not something you point at a bad guy in hopes he will get scared and run away. A red dot dancing on the chest of your enemy is not good practice, because if he is a lethal threat, the red dot should be there long enough for you to shoot, not long enough to be noticed by your assailant. Lastly, lasers can dance. While you are holding a weapon mounted laser perfectly still in your hands, at distance you will see the beam wiggling significantly on your target. This is due to the mechanics of your body shaking the laser. This is normal and do not waste time trying to steady it perfectly. If the laser is on target, press the shot and you will hit. (See previous paragraph about trigger control and training with a laser) Again, you will need to train with the laser. It is my experience that shooters who rely on a laser weapon sight, typically shoot slower. Putting the laser on target may take you longer than shooting instinctively by punching out and focusing on your front sight. I hope this has been an informative, practical look at laser and lights for a home defense firearm. Be it a long gun or pistol, they are highly effective tools I believe in, train with and I think once you mount one to your home defense gun you will agree. Remember, your mind is the weapon, everything else is just a tool. The light and laser is only as effective as the well trained mind applying the correct tool to the problem. Let us know in the comments your experiences with lights and lasers for guns especially for home defense.